Assistant Jobs Recruitment Vacancy 2013 LIC Housing Finance Ltd Online application Procedure Apply Date Schedule Interview Eligibility Criteria Pay Scale job location 2013 recruitment Assistant LIC Housing Finance Ltd.
Are you looking for jobs at LIC Housing Finance Ltd? Do you want to know the latest Jobs at LIC Housing Finance Ltd? Do you want to work in the post of Assistant at LIC Housing Finance Ltd? Then let us inform you about the recent Job Vacancy details of LIC Housing Finance Ltd as Assistant. LIC Housing Finance Ltd invites application from the eligible candidates for the 2013 Recruitment of Assistant and the details as follows. • Job Location of Assistant Recruitment 2013: - Candidates will be placed at various cities of India under LIC HFL (Housing Finance Limited). • LIC Housing Finance Ltd Recruitment & Vacancy Details: - LIC Housing Finance Limited (LIC HFL) invites applications for the recruitment of Assistant. • Eligibility, Qualification Criteria for Assistant Job (Recruitment) of LIC Housing Finance Ltd: - Graduates having at least 45% marks with the knowledge of Computer application. • Age Limitation requirement for Assistant in LIC Housing Finance Ltd: - Age between 21 & 35 years as on 7th January 2013. Issue of application form starts on 7th January 2013. Last date of submission of applications is 22nd January 2013. • Where & How to Apply for 2013 Assistant Job (Recruitment) in LIC Housing Finance Ltd: - Interested candidates are requested to complete the registration process [online mode only] within 22nd January 2013. Selection will be done on the basis of Written Test [to be held on 17th February 2013] & Personal Interview round. Online Applications is going on at www.lichousing.com website of LIC Housing Finance Ltd.
Don’t forget to Apply within the scheduled date for the 2013 Assistant jobs in LIC Housing Finance Ltd and to brighten your professional career. Apprentice Development Officer Jobs Recruitment Vacancy 2012 Life Insurance Corporation of India (LIC) Kolkata Online application Procedure Apply Date Schedule Interview Eligibility Criteria Pay Scale job location 2012 recruitment Apprentice Development Officer Life Insurance Corporation of India (LIC) Kolkata. Are you looking for jobs at Life Insurance Corporation of India (LIC) Kolkata? Do you want to know the latest Jobs at Life Insurance Corporation of India (LIC) Kolkata? Do you want to work in the post of Apprentice Development Officer at Life Insurance Corporation of India (LIC) Kolkata? Then let us inform you about the recent Job Vacancy details of Life Insurance Corporation of India (LIC) Kolkata as Apprentice Development Officer. Life Insurance Corporation of India (LIC) Kolkata, India’s trusted brand & market leader in Life Insurance, invites application from the eligible candidates for the 2012 Recruitment of Apprentice Development Officer and the details as follows. • Job Location of Apprentice Development Officer Recruitment 2012: - Candidates will be placed at LIC Offices under the jurisdiction of Zonal Office, Kolkata. • Life Insurance Corporation of India (LIC) Kolkata Recruitment & Vacancy Details: - Recruitment of Apprentice Development Officers in LIC [Approximately 669 vacant posts] under Kolkata Zonal Office. Job of Apprentice Development Officers is primarily a Marketing Job involving movement in the allotted area; job includes responsibilities like – recruiting people as Life Insurance Agents, trained recruited people, helping newly recruited agents and interacting with customers providing after sales service etc. • Eligibility, Qualification Criteria for Apprentice Development Officer Job (Recruitment) of Life Insurance Corporation of India (LIC) Kolkata: - Young Graduate in any stream or a Fellow of the Insurance Institute of India, Mumbai having a flair for selling are advised to apply. • Interview Date Schedule for 2012 Apprentice Development Officer Job (Recruitment) of Life Insurance Corporation of India (LIC) Kolkata: - Last date for registration of application forms is 22nd December 2012. • Where & How to Apply for 2012 Apprentice Development Officer Job (Recruitment) in Life Insurance Corporation of India (LIC) Kolkata: - Life Insurance Corporation of India (LIC) invites Online Applications from eligible candidates for selection & appointment as Apprentice Development Officers in its various Offices under the jurisdiction of Kolkata Zonal Office. The selection & appointment will be subject to the reservation of SC/ST/OBC as per rules and on the basis of Online Test & Interview. Applications are to be submitted Online mode only through www.licindia.in/careers/htm website. Application Fee of Rs.500/- can be paid in Cash from 2nd working day after registration and can be paid within three working days at any of SBI Bank (wherever payable) along with the system generated fee payment challan. For further details please visit www.licindia.in website and do complete your registration latest by 22nd December 2012. Don’t forget to Apply within the scheduled date for the 2012 Apprentice Development Officer jobs in Life Insurance Corporation of India (LIC) Kolkata and to brighten your professional career. LIC Mobile is the official Mobile Application from Life Insurance Corporation (LIC) of India. The LIC Mobile application is developed for the LIC customers & marketing personnel. The LIC Mobile Application has all information about LIC products & portal services and can be accessed anytime anywhere on your mobile phone as well. Life Insurance Corporation of India (LIC) has come up with the Free to download LIC Mobile Application for the customers to get every details about LIC products without moving out. Options for viewing Products of LIC, Premium calculation, Check Policy Details, Apply for Policy & LIC Branch contact information – available at LIC Mobile Apps. Customers can check LIC Plans on mobile can calculate Premium through Premium Calculator option, Premium Payment modes and can also apply for new LIC Policy via mobile phone anytime. Plan Option provides the facility to check information about all LIC Plans available. 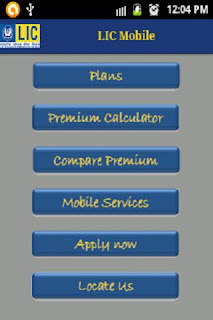 Premium Calculator option helps to calculate the Premium and provides information about Age, Policy Term, Risk Cover Amount & Accident Benefit as well. Also you will get the information about Payment Mode options here. Compare Premium option is developed to help customers to select their desirable LIC Plan & Policy after comparing with others. Mobile Services option helps LIC customers to get help & to send their feedback easily. Apply Now option is for customers who want to apply for new policy. After registering your application, LIC Official will visit your place to help you. Locate Us option helps you to get address, phone number of LIC Offices nearby you. People having a Smart Mobile Phone (Android 2.1 & above) can easily download LIC Mobile Android Device Application from the below mentioned link. • How to download LIC Mobile Application of Life Insurance Corporation of India? The LIC Mobile Apps is FREE to Download and only 9.5MB in size. If you have a Smart Mobile Phone then just visit https://play.google.com/store/apps/details?id=com.lic.MobileApp&feature=search_result#?t=W251bGwsMSwxLDEsImNvbS5saWMuTW9iaWxlQXBwIl0. –OR- https://market.android.com > Finance Section to Download LIC Mobile Application for Free. So, Download the LIC Mobile Application on your Smart Mobile Phone for Free and get every information about LIC Plans & Policies anytime. Assistant Officer Jobs Recruitment Vacancy LICHFL (LIC Housing Finance Limited) Kolkata Bengal Howrah Hooghly Online application Procedure Apply Date Schedule Interview Timings Assistant Officer Jobs Recruitment LICHFL (LIC Housing Finance Limited) Eligibility Criteria Pay Scale job location jobs recruitment Assistant Officer LICHFL (LIC Housing Finance Limited). LICHFL (LIC Housing Finance Limited) invites application from the eligible candidates for the Recruitment of Assistant Officer and the details as follows. • Assistant Officer Recruitment Vacancy Job Location: LIC is going to recruit Assistant Officers (Executives) in various LIC Offices in India in the LIC-HFL (LIC Housing Finance Limited) department. • Name of Vacant Posts Recruitment of LICHFL (LIC Housing Finance Limited): Assistant Executive Officer recruitment at LICHFL. • Assistant Officer Job Head Office Address of LICHFL (LIC Housing Finance Limited): LIC Housing Finance Limited Office Address – Bombay Life Building, 2nd Floor, 45/47, Veer Nariman Road, Mumbai-400001. • Eligibility Qualification Criteria Parameters for Assistant Officer Jobs Recruitment of LICHFL (LIC Housing Finance Limited): Graduates of any stream with minimum of 50% marks and having Computer knowledge. • Age Limit / Job Experience requirement for Assistant Officer in LICHFL (LIC Housing Finance Limited): 21-35 years of age as on 01-12-2011. • Interview Date Schedule for Assistant Officer Jobs Recruitment of LICHFL (LIC Housing Finance Limited): Applications can be made online from 8th December 2011 and the last date for submission of Online application is 24th December 2011. • Where How to Apply Process of Assistant Officer Jobs Recruitment in LICHFL (LIC Housing Finance Limited): Candidates can only apply online through www.lichousing.com website and the selection will be based on written test and then personal interview round. The written test is scheduled to happen on 22nd January 2012. Don’t forget to Apply within the scheduled date for the Assistant Officer jobs in LICHFL (LIC Housing Finance Limited) and to brighten your professional career. LIC Micro Insurance ASM (Area Sales Manager), Sales Executive & Collection Agent Jobs Recruitment Vacancy Simoco & LIC Kolkata Kolkata Bengal Howrah Hooghly Online application Procedure Apply Date Schedule Interview Timings ASM (Area Sales Manager), Sales Executive & Collection Agent Jobs Recruitment Simoco & LIC Kolkata Eligibility Criteria Pay Scale job location jobs recruitment ASM (Area Sales Manager), Sales Executive & Collection Agent Simoco & LIC Kolkata. Simoco Telecommunications (South Asia) Limited, Kolkata in association with LIC Life Insurance Company is going to Recruit nearly ten thousand people in various locations of West Bengal in their Micro Insurance project. Hence, Simoco & LIC Kolkata invites application from the eligible candidates for the Recruitment of ASM (Area Sales Manager), Sales Executive & Collection Agent and the details as follows. • ASM (Area Sales Manager), Sales Executive & Collection Agent Recruitment Vacancy Job Location: Different areas of West Bengal & Kolkata in Micro Insurance project of LIC Insurance Company in association with SIMOCO. • Name of Vacant Posts Recruitment of Simoco & LIC Kolkata: Area Sales Manager (ASM) recruitment (total 100 vacancies), Sales Executive recruitment (total 500 vacancies) and 10000 vacant posts of Collection Agent. • Eligibility Qualification Criteria Parameters for ASM (Area Sales Manager), Sales Executive & Collection Agent Jobs Recruitment of Simoco & LIC Kolkata: Candidates should be Graduate for the post of ASM or Sales Executive and Higher Secondary passed (Madhyamik for interior rural areas of Bengal) for Collection Agent applicants. • Where How to Apply Process of ASM (Area Sales Manager), Sales Executive & Collection Agent Jobs Recruitment in Simoco & LIC Kolkata: Interested candidates should send / submit their detail biodata along with testimonials at Simoco Telecommunications (South Asia) Limited, Godrej Genesis Building, Block-EP & GP, Salt Lake, Sector-V, Kolkata-91 (Phone number – 033-23575581). Candidates may also call toll free number 1800-2000-104 (or at 033-4004 9976) numbers for further enquiry and to fix Interview Date. Don’t forget to Apply within the scheduled date for the ASM (Area Sales Manager), Sales Executive & Collection Agent jobs in Simoco & LIC Kolkata and to brighten your professional career.